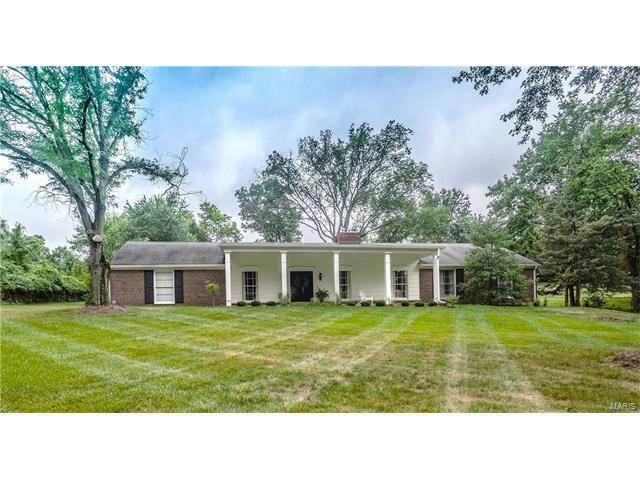 Lovely Sprawling Ranch on a Gorgeous 1 Acre Lot in Desirable Town & Country. Beautiful Covered Front Porch, Center Hall Plan with Gleaming Hardwood Floors Through-Out. Inviting Entry, Formal Dining Room with Wainscoting. Spacious Living Room Offers See-Thru Fireplace to Family Room w/Bay Window, Dental Molding & Can Lighting. The Kitchen is Updated and Boast 42in Cherry Cabinets with Crown Granite Counters, Large Built-in Pantry and Opens to The Bright Breakfast Room w/Gorgeous Butlers Pantry. The Master Bedroom has Double Closets and Private Bath with Adult Height Vanity. The Additional Bedrooms are Both Very Spacious, the Hall Bath is Beautifully Updated with Double Bowl Vanity and Newer Fixtures. Spacious Patio and Fenced Area. This Home is located on a One Acre Picturesque Lot on Private Street in the Heart of Town & Country.